The first problem most restaurateurs face in their journey to lease a restaurant is caused by unrealistic expectations. 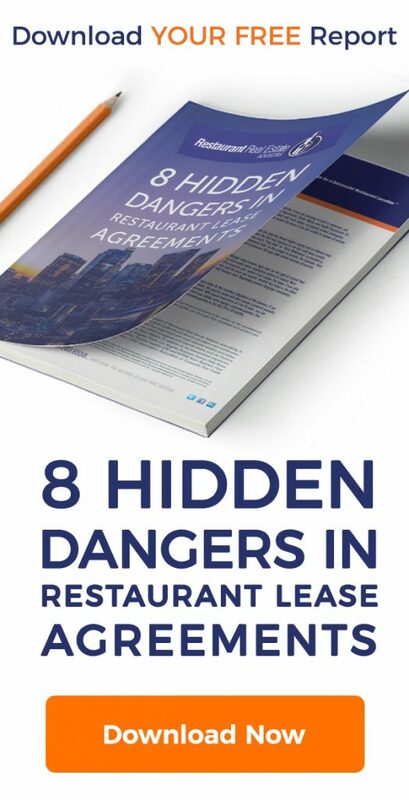 Time can be your biggest ally, or your greatest foe when you lease a restaurant. Most restaurateurs under estimate the time it takes to find the right location, negotiate a lease and build or remodel the space. Give yourself more time than you think you need. A good rule of thumb is six months to find and lease a restaurant and another six months to permit, remodel and open for business. Louis Pastor said that more than a century ago and it remains true when you lease a restaurant. When you do find a location you like, things start to move fast. If you are not prepared, you will find yourself scrambling to gather information and causing delays that can jeopardize the deal. Prior to starting your search you need to have the basics in place. This French term, ( pronounced meez-on-plahss) means “everything put in It’s place”. Prior to starting your search for a restaurant location, it’s important to put everything in its place. Your recipe determines the main ingredients needed to successfully create your dish. Your concept and business plan determine where you will lease a restaurant. The lower your prices the more your location will depend on convenience and access and less on income levels. Does your concept rely on office workers for lunch or a water front location for special occasions? The rent you pay is determined by your annual sales. Add too much salt or cayenne pepper, and you will ruin the dish. Pay too much rent, and you will burn a hole in your wallet. Your Business Plan determines where you lease a restaurant as well as your methods or options to acquire a site for your restaurant. Broken down monthly, you can pay between $5,000 and $8,300 per month. Skip this if you want to look like a fool. Prior to submitting any offers it’s important to be prepared to sell yourself. You may not need all of the above, but you should be prepared at a minimum to provide a credit application including balance sheet and a business plan or executive summary. Now that the knives are sharp, time to shop for a restaurant. 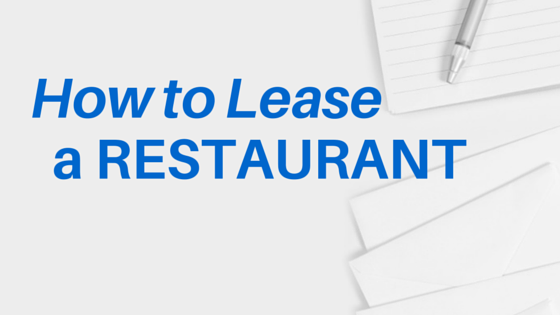 There are three basic approaches to finding a restaurant for lease. There are numerous free and paid services that advertise restaurants for lease. Click here for a list of Internet sites that advertise restaurants for lease and restaurants for sale. If you are going to lease a restaurant, there is a 99.9% chance a commercial real estate agent or broker will represent the landlord. Whether you decide to hire your own broker or lease a restaurant on your own, it’s important to understand the role of the commercial real estate broker and how they are compensated. Read this article prior to contacting an agent. Are you thinking about hiring an agent? Read this article to get the most value from a commercial real estate agent or restaurant real estate advisor. Driving the neighborhoods that fit your concept is a great way to learn the market and determine important factors such as traffic patterns and which areas attract the most visitors. Unfortunately, driving and calling “For Lease” signs is time consuming and frustrating. If you want to know even basic information such as square footage, rental rate and if restaurant use permitted, you will need to leave a phone number and hope you receive a return call. To make matters worse, you won’t know which property you called about unless you keep detailed notes. Download this form to keep track of properties. When you speak with landlords or commercial real estate agents you will need to ask some specific questions. 1) Is there an existing hood system? 2) Is there a grease interceptor? 3) How much is the NNN charge? 4) How long has the restaurant been closed? 6) How much parking is provided? Prior to scheduling a meeting to see the inside of a prospective space, it’s a good idea to drive by the site and confirm this is a location and neighborhood that meets your general criteria. If you are viewing a restaurant that is currently open for business, don’t ask any employees or neighbors’ questions. In many cases the employee’s are not aware. If you would like to see the interior act like a customer and order something to eat or drink. You will need to schedule a meeting to see the kitchen and areas not visible as a customer. When you find a restaurant location you like, it’s time to negotiate. In most cases, you will be making the initial offer. The most common process is to submit a Letter of Intent ( LOI). The Letter of Intent outlines the major deal points to be included in the Lease Agreement. If you have been working directly with the Listing Agent, the agent will offer to draft this on your behalf. In most cases the LOI is non-binding on either party and used as an outline to prepare a lease. Negotiating a Letter of Intent can take anywhere from a few days to many weeks depending on the landlord and how hard both parties negotiate. Once you have an agreed upon LOI, the landlord will prepare a draft lease for your review. The lease will include all of the terms outlined in the LOI in addition to additional legal language covering many more items that are typically not discussed during the LOI stage. Lease agreements range from just a few pages to more than 150 pages in length. If you addressed the major business and economic issues thoroughly during the LOI stage, the legal issues in the Lease can usually be worked through. Lease negotiations can take anywhere from a few days to a month. Lease negotiations are either handled directly between the landlord and the tenant (sometimes with the broker/agent as the middle man) or between the landlord’s attorney and tenant’s attorney. Final lease agreements will be prepared for signature once all terms have been agreed upon by both parties. The landlord or landlord’s agent or attorney will either send hard copies for signature to the tenant or arrange for both parties to meet and sign together. You can expect to sign two to four copies depending on how many parties were involved in the transaction. The landlord, tenant and brokers if any, each receive a fully signed copy for their records. At this time you will deliver a cashier’s check made to the landlord for the first month’s rent, NNN and security deposit. In addition, the landlord will require you to provide proof of liability insurance naming the landlord as additional insured. You should arrange insurance during the lease negotiation period. If the space is vacant and the landlord is not responsible for any work prior to delivery the premises, you may receive the keys when you sign the lease. If the premises will be delivered at a later time, perhaps after the landlord completes the landlords work, arrangements will be made to deliver the premises. It is a good idea to utilize an amendment such as a Letter of Lease Commencement so there are no discrepancies about the start date of the lease. The information provided above provides a high level road map of the steps required to find a restaurant and negotiate a lease agreement. Your journey starts when you create your business plan. Your business plan will determine what type of space your restaurant requires and where you will begin your search. Being prepared with your business plan and financial information you will have the ability to move quickly when opportunities arise and position yourself as a successful business person. You have all of the tools you need. You don’t need to rely on real estate agents for information. You will learn a great deal by spending time in your target neighborhoods and speaking with brokers, landlords and restaurateurs. If you are searching for sites on your own, you’re not alone. Help is just a phone call or email away. If you have questions, need help writing an offer, or would just like a second opinion, shoot me a message here. The process of finding a restaurant location is not difficult, but it does take time and work. Allow yourself enough time. Leasing a restaurant is pretty straight forward if you understand the steps required and seek help from professionals such as restaurant real estate advisors, architects, attorneys and contractors if you have questions. I hope you found this information helpful. If you would like to learn more or require more in-depth information regarding site selection, lease negotiations, permitting, construction, buying or selling restaurants send me an email with your questions. Thanks for the tip about how to lease a restaurant. I didn’t realize it could be so simple. A friend of mine is running a local chain. I’ll have to show him a copy of this post. Thanks for sharing! Thanks Joel. Most of business is helping chains expand. I’m happy to answer any questions your friend may have about expanding their brand. We are are looking to lease a space. As far as building maintenance and repair, is the tenant or lessor usually responsibe for things like roof and incoming water lines? Typically landlord covers roof, but you will be charged back your pro rate share in the CAM charges. If landlord needs to install a new roof, the cost should be amortized over the useful life of roof and you would be charged pro rate share of that amount. Waterlines outside of your space should be covered by landlord. If you had a line break inside of the space you would typically be responsible. A good real estate attorney should be able to limit your exposure on some of these items. Great article. I am currently looking at an existing restaurant space that has been in business for 27 years but hasn’t remodeled anything in that time. Would there be any issue with the existing grease trap and hood system/fire suppression system where i may have to replace it that i should consider? I know I’m doing to have to remodel the dining room because it is outdated as well as update the bathrooms to ADA compliance. Is the restaurant still operating? Where is the property? In Los Angeles if the remodel costs more than $100,000 you will most likely be required to install grease interceptor. If its an operating restaurant and you are only doing a light remodel front of house you can probably avoid major upgrades.I would have an experienced architect/contractor inspect the space and review proposed remodel to determine if major upgrades or code upgrades will be required. I would ask Top Round what was required for their location on La Brea. It was a conversion of an older fast food restaurant. Feel free to email me directly if you need referrals of architects, etc. Best of luck! I have been offered an opportunity to open a small 35 seat restaurant in a Bed & Breakfast. The kitchen, servers area and dining area are all equipped. The restaurant area in total is 420 sq ft. Breakfast & Lunch is served and it will be open to the public from 8 am – 2:30pm. The owners have not set an opening date for the Rooms. we are opening the restaurant first. Once renovations are done opening should be mid Feb of 2017. I have owned 2 restaurants and both I had my own equipment etc. I’m not exactly sure how the leasing works when using their equipment. Any formula for this type of restaurant leasing? Typically if landlord already has the equipment in kitchen its included in the lease. In some cases they may charge you some money upfront to buy the equipment. Anything attached such as hood always becomes landlord property. They will probably just have language that its as-is and where is and you are responsible for repairs or replacement. I would include language that if you replace anything that is not permanent you have right to remove at end of lease. Best of luck! Thanks buddy for sharing this informative blog with everyone and also explaining that how important it is to make the things clear before leasing a restaurant or any other property. I am also looking forward to buy a restaurant but I have never think before like this earlier! After reading your blog , many things came in mind which I am going to follow. Mark, I just came across this blog post from you. Its Great. Very informative. I will add in something that just occurred and I think it could be helpful. But first I wanted to say it was a pleasure working with you on that Larry Holmes Property. You can’t win all the fights. But we went the distance. The story starts with a medium neighborhood strip center, is a very quaint but well-traveled area. There was a Pizza shop, Bravo’s and there was Beer distributor, both in line but in different locations to the center, The pizza shop was in a visible, yet tired location, too many years in place and no continued modifications by either the landlord or the tenant. There was a Wawa at the corner next to the pizza shop; they went out of business there four years now. The beer distributor was not doing well, wrong location. The landlord was able to offer this relocation opportunity to each of these tenants, offered to absorb some of the cost and spread the additional costs over the course of each respective term. Now, the Beer distributor is in a very visible and easily accessible location. In most relocation clauses the cost of the relocation is absorbed in total by the landlord. Both should do very well. The landlord thought outside the box. Hi Jack..nice to hear from you. I agree if the both parties work together things can work out better for both sides. Hi, Mark I have read you blogs thanks for so much useful informations. I am currently buying a still operating restaurant to remodel into a different type of restaurant and requires a big investment, I want to know if I purchased the business and put a great amount of money for remodel, in this case will the landlord give TI or free 6 months of rent? The one downside about buying an existing restaurant is you are buying the existing lease. Most landlord’s won’t provide TI’s or free rent unless they are excited about your concept and willing to provide a new lease. If you are buying a lease with below market lease rate, the landlord will be more willing to provide TI’s/Free rent if they can increase their rent. I would approach landlord about writing a new lease and see if they are open to it. If not, I would extend escrow to give you enough time to secure any permits you may need to start your remodel. This will minimize lost rent during remodel. I hope this helps let me know if you have any questions. Where is the restaurant located? Are there any industry “rules of thumb” regarding outdoor seating options. For example, if the lease is $20.00 per SF for the indoor space, is there a logical discounted percentage to be considered for outdoor dining area? I suppose it would depend on if a canopy would be allowed, otherwise it would be more of a seasonal consideration. I have heard that 1/3rd of the finished indoor space lease amount is a good starting point. Thanks for any insight and I enjoyed your article very much! I was made aware of an up and running restaurant advertising that they are leasing themselves for $90,000.00 + rent. Does this mean they are selling the business for that price and those interested can buy it for that amount? Thank you for your time and information. It sounds like they are selling the business and you will assume the lease. I need your feedback on a problem I bought a restaurant and redid the space as it was 20 years old it is in a short strip of three buildings owned by one land lord. When I opened the next door rennet was a bakery now after three years of building a burger specialty business the landlord closed the bakery and put in a burger specialty restaurant , this has stolen business and what recourse do I have to terminate my lease? Mark looking to buy a restaurant in San Diego, but is not much available, find a restaurant that is for lease, what the difference between lease or buy a restaurant how a lease work? It’s a good idea lease a restaurant? When you buy a restaurant you are assuming the existing lease. If the lease is good it ca be a good deal. Downside of buying existing lease is if the original lease was not negotiated well you inherit the sellers lease terms.Buying a restaurant often saves you the time and expense of permitting and building out a new space. What advice will you give to someone who has wanted to open a restaurant. But to do so means giving up their current jobs. I been with my current job for over 15 years and have invested aggressively in my stock and 401k plan – I plan on keeping in/rolling over. And, I never worked in a fast food/restaurant environment. I appreciate that you listed the factors such as menu, target customer, and annual sales which determine where you will lease a restaurant. My friends and I are eyeing this commercial space downtown for this cafe we have been planning. I’m looking to hire a professional consultant who can do a commercial space competitive analysis. This could help us have higher chances of having a successful cafe. Thank you for this informative article.